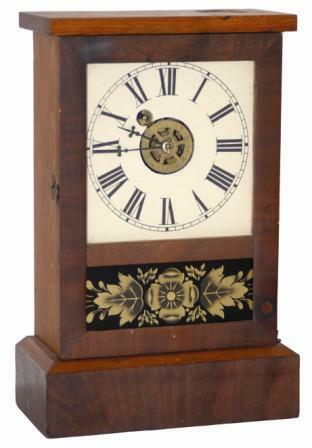 Waterbury Clock Company mantle clock, "Cottage", ca 1861. Case is only 11" high, appears to have some mahogany and some pine woods. Veneer on the door and around the base may be mahogany. Replaced tablet, repainted dial, complete paper label on the back. This little clock has a thirty hour movement with an alarm movement in the bottom. Ly-Waterbury, page 407.